There were five midweek matches around the MLS on Wednesday, featuring hat tricks, record-setting performances and more. Gerso Fernandes scored three second-half goals in 13 minutes, Tim Melia had his seventh shutout and Sporting Kansas City beat the Seattle Sounders 3-0 on Wednesday night for sole possession of first place in the Western Conference. Kansas City (6-2-4) is undefeated in 15 straight home games. Seattle (2-5-4) lost its third straight. Fernandes is the first Sporting KC player with a hat trick since Birahim Diop in 2010. In the 56th minute, Fernandes had a deflected corner kick fall to his feet and he slotted it inside the near post. Two minutes later, Fernandes one-touched a shot off the post and he put it home after blocking a clearance attempt. In the 69th, Graham Zusi found space along the edge of the 18-yard box and found an open Fernandes at the penalty spot. Melia kept it scoreless in the first half with two quality saves just before halftime. He stayed low to kick away Alvaro Fernandez's breakaway shot in the 45th and on the ensuing corner kick, Melia dove to his left to deny Cristian Roldan's shot from distance. Aaron Maund scored the go-ahead goal in the 51st minute and Real Salt Lake beat New York City FC 2-1 on a snowy Wednesday night. Real Salt Lake (3-7-2) snapped a four-game losing streak. NYC (5-4-2) had its three-game undefeated streak snapped. With a stop of a Tommy McNamara strike in the 15th minute, RSL goalkeeper Nick Rimando made the 1,475th save of his career, passing Kevin Hartman to set the all-time MLS record. Rimando already held the all-time MLS marks for wins (186) and shutouts (131). Albert Rusnak tied it at 1 for RSL in the 38th minute on Jefferson Savarino's first MLS assist. Savarino cut back his defender, rolled it across the top of the 18-yard box and Rusnak settled it for a shot from distance. Rusnak's corner kick in the 51st was headed in by Maund. NYC opened the scoring in the fourth minute to extend its scoring streak to 10 games. RSL's deflected back pass fell to Sean Okoli's feet and he dribbled between two defenders to the edge of the six-yard box for a sliding finish inside the far post. It was his first MLS goal. 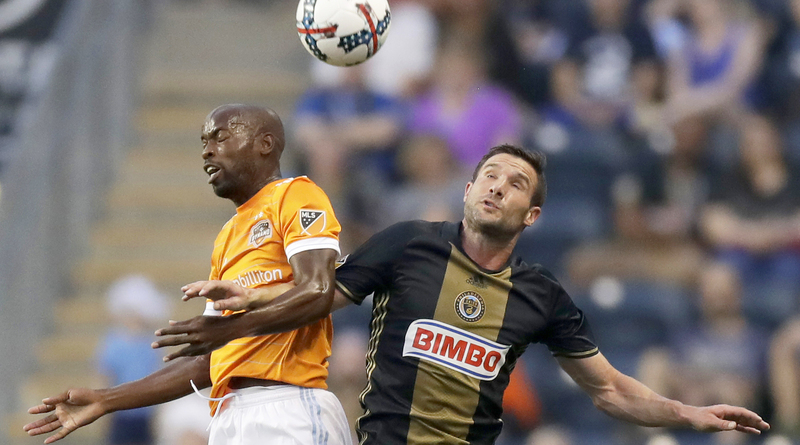 Fabrice-Jean Picault and Ilsinho scored, Chris Pontius had two assists and the Philadelphia Union beat the Houston Dynamo 2-0 on Wednesday night for their third straight victory. Philadelphia (3-4-4) is unbeaten in five straight, with four straight shutouts by goalkeeper Andre Blake. Houston (6-4-1) dropped to 0-4 on the road with just two goals, both coming in its first match against Portland. Picault jumped through the center of the box to head Pontius' cross off the crossbar and into the net in the 17th minute. Ilsinho scored his first goal of the season in the 38th minute, sneaking through the center of the defense to beat goalkeeper Joe Willis from the penalty spot. The Dynamo had a good scoring chance in the 40th minute, but Blake dove to his right to deny Mauro Manotas' breakaway shot. 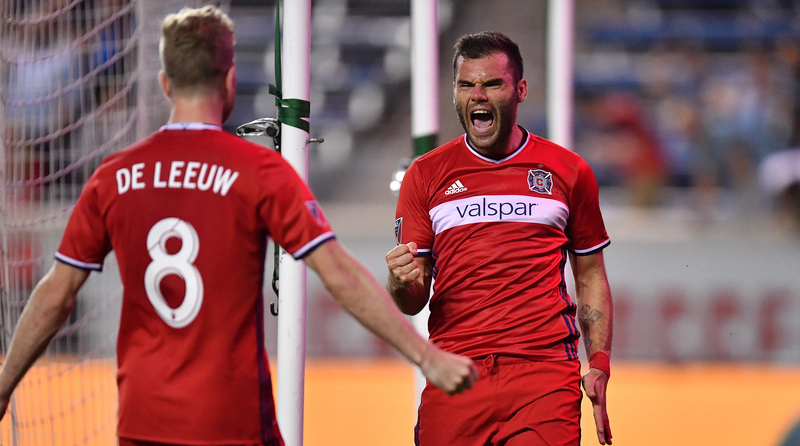 Nemanja Nikolic scored two goals, Michael de Leeuw had two assists and the Chicago Fire beat the Colorado Rapids 3-0 on Wednesday night for their fourth straight home victory. Nikolic had his ninth and 10th goals of the season to break a tie with Houston's Eric Torres for the MLS lead. The Fire (5-3-3) are unbeaten in their last nine at home and hold a 21-8 scoring advantage during that span. Nikolic opened the scoring in the 15th minute, putting through a header from the penalty spot. David Accam then found net for fifth time, burying a loose ball in the 57th minute. Nikolic added the exclamation point in the 74th minute, taking advantage of de Leeuw's fast-break opportunity. De Leeuw pushed the ball behind the Colorado defense, then found a streaking Nikolic for the goal. Shkelzen Gashi had an opportunity for the Rapids (2-7-1) in the 72nd minute, but his shot was saved by Matt Lampson. Carlos Rivas scored in the 80th minute for Orlando City FC, and Chris Wondolowski tied it three minutes later for the San Jose Earthquakes as the clubs played to a 1-1 draw on Wednesday night. Rivas' second goal of the season for Orlando City (6-3-2) was assisted by Victor Pagliari Giro and Kaka. Wondolowski, who quickly answered for San Jose (4-4-4), was set up by Tommy Thompson. After receiving a caroming corner kick at the top of the box, Thompson found Wondolowski near the left goal post for the tying score. Kaka broke free for a final scoring chance for Orlando City in the 90th minute, but San Jose goalkeeper David Bingham made the save to preserve the draw. Scoring opportunities were sparse almost all night, with the teams combining for 29 total shots but just seven on target. This was the third all-time meeting between Orlando City and San Jose, with each ending in a tie.